The original branch of the American-style cupcake bakery. It came of age during the red-velvet craze, but Notting Hill’s petite Hummingbird Bakery still sends the sugary hearts of cupcake fiends aflutter. On every day of the week, there are rainbows of American-style cupcakes in timeless flavours like Oreo, carrot cake, and (of course) red velvet, as well as vegan varieties and super-cute occasion cupcakes dressed in edible glitter and the like for whatever holiday is around the corner. There are supplementary treats like brownies, whoopie pies and layer cakes, but most people are here for the slick-looking cupcakes. Their appeal lies in the icing – that texturised buttercream crown. It’s not overly cloying and it’s well-proportioned with the sponge base. Unfortunately, not everything smacks of day-of-baking freshness. On a recent cupcake pit-stop (yes, that’s a thing), the cake base was just too dry and crumbly, tasting on the cusp of stale. Still, the icing was perfection. As this place is always full of bumbling tourists and there are only a handful of seats, we recommend that you take your cake to go and skip the extra eat-in charge. Cupcakes and coffee for two: around £10. I've seen that queue on Portobello Road on Saturday's but luckily I have been in more quiet times too (best time: around 16:00 when the market is closing). This cute little shop part of the Hummingbird Bakery chain is full of delicious cakes and cupcakes. If you like cake, you are going to love it. Red Velvet is the best according to many, and my favourite too, followed by the salted caramel one! Slurp. This has got to be making the most money by square foot of any shop in London. Hummingbird Bakery on Portobello Road is the tiniest little cafe with fresh cakes and cupcakes and on Saturday a little table outside so they can serve people as quickly as possible. 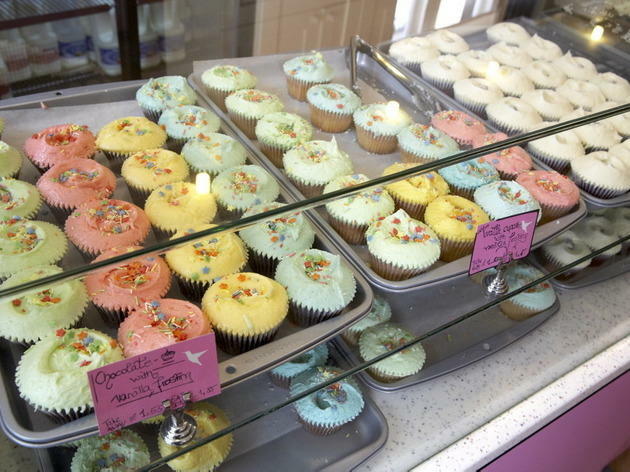 They are my favourite cupcakes in London and they are beautifully displayed behind the counter, all set off by bright and cheery artwork. 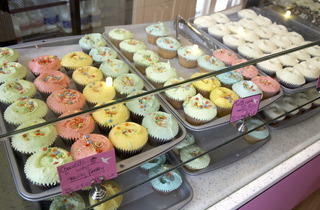 You can order cakes to collect or just queue for a slice or a cupcake. You can't go wrong with a Black Bottom cupcake, or a Red Velvet or maybe both. There's nowhere to sit in this branch and it's especially mental on Saturday when the market is on so just get it to go and find somewhere to perch at the side of the road or wander around with it. It is Portobello Road after all darlings.